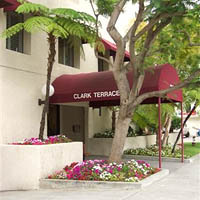 Clark Terrace is a 41-unit, project-based Section 8 community for people 62 and over. The waiting list is currently closed. The property includes single and one bedroom apartments with underground parking. Clark Terrace is located near Beverly Hills (one block from the intersection of Pico and Robertson) and is within easy walking distance of restaurants, shops, banks, churches, temples, and community centers. All units at Clark Terrace include central air conditioning and heating, refrigerator, stove, window blinds, wall-to-wall carpeting, vinyl kitchen flooring, and smoke detector/fire sprinkler. Clark Terrace also features a spacious community room with a piano and exercise area. Regularly scheduled activities include a weekly bingo game, Wednesday movie nights, monthly birthday parties, and potlucks. The large patio outside the community room offers an area for residents to barbecue.